Save the Woods and Soccer Field! The Mahone Bay Town Council announced on May 17, 2007 that it has accepted a concept proposal for a $24 million development of a 16 acre property owned by the Town. A number of citizens and taxpayers of the Town of Mahone Bay have concerns about the development. There is a strong belief that this development will change the character of this Nova Scotian treasure forever. The property, located on either side of a small valley in the first rise of low hills behind Mahone Bayâ€™s waterfront on West Main Street, is a part of the old school property and consists of a soccer field, an old borrow pit, some wetlands and some forest. The soccer field is a â€˜village greenâ€™ in addition to being a very fine field where some 100 people of all ages play soccer. Most are young and the majority from the areas that surround Mahone Bay. The woods behind the soccer field are a quiet and beautiful place enjoyed by a number of residents for strolls, walking their dogs, bike riding and cross-country skiing. The property lies at the heart of a spacious residential neighbourhood. If the proposed development goes ahead, none of its key features can or will be saved. The Town of Mahone Bay is suffering from a shrinking and aging population and wants to reverse this trend by making affordable housing available for seniors and young families. Over the next 5 â€“ 7 years a developer will provide the following types of affordable housing using this land: 96 one and two bedroom seniorsâ€™ apartments; 30 assisted living apartments for seniors; 36 two and three bedroom apartments for the general population; an indoor swimming pool; 36 duplex homes; 32 single family homes. If you want more and detailed information about the development, please see the detailed factual description on “The Proposed Development”. Please read and signÂ our petition. View and add comments – this is a blog. The first 5 comments were originally posted on another blog that has been superceded by this one. I live at 143 fairmont and feel deep dismay at the possibility of losing this precious green space- the soccer field and the woods. I’ve been enjoying them for over twenty years. These 17 acres of soccer field and Acadian woodland are the heritage of this Town. They are cherished by those who live near them and walk them daily. We have to preserve our green space for future generations. And no, there is not a lot of public green space in Mahone Bay, most of it is privately owned. Our public green space is the jewel in the crown of this town. The Town is in hard financial shape, and we need seniors housing but not at the expense of the woods and field. An intensive 229 unit development would alter the character of this town. There are other lands for the seniors complex. (2 acres by the fire hall) Why have there been no formal public hearings? At this point, I think it is important that we unite around a common goal: stop the existing development project which would destroy the playing field and public woodland. This will allow further consultation with the community over community development and what that should look like; this will allow us to get input from others; and this will allow us to examine the financial situation in Mahone Bay, which has been put forward as justification for selling public lands to a private developer. Does any one know the process here? in terms of what needs to be in place before the bulldozers move in? Do this have to go through a Regional Planning Commission or other bodies? What are our options here and where is the best place to derail this proposed development (sic). My name is Tim Worthington and I live at 132 Fairmont St. and will have the reason for the sunroom we built on the back of our house destroyed if this development proceeds. Besides the obvious dismay I have with this development, I have not heard anyone address the issue; who and where are all these young families with children? More importantly, what is it that they are going to do if they come here? Where are they going to work? Certainly not Mahone Bay. If it is Bridgewater, who is hiring over there that we have not heard about. A Wal-Mart employee is probably not going to be buying a house in Mahone Bay. Is this a case of “if we build it they will come”? I have also been told that none of the engineering work has been done, so how can the developer possibly know if this whole project is viable? Has the developer actually walked up Fairmont St. to see the width of the road that is proposed to access one branch of the development? If he has, how can he possibly think that it is appropriate? Where is the water coming from for this volume of people? Where will the waste water and sewage go? Certainly not the existing lines which are in need of repair. Who pays for all this to be done, the developer or the town? Who is on the hook for the maintenance, the town? Whose tax dollars are being used to fund this exercise? Who asked me if they could please come and destroy our sanctuary? I’m a young person (25) and reflect fondly on childhood memories from the beautiful lands of the soccer field/woods. I now live in Halifax and would love to move back to Mahone Bay but personally I would rather live in one of the unique, older homes surrounded by trees than in a row of prefab houses where there is nothing but a senior’s swimming pool to enjoy! HA. I’ll be happy to help in any way I can… and huge thanks to the Haysom/Hearder family for all their efforts so far! There must be certain basic steps required for any new development of this size (proposed 30% increase in town population??). I am not a city-planner by any stretch, but I can guess that Step Number One is that the Town to be developed must have a Plan which any proposal must fit (or not) and that Step Number Two is that the citizens are invited to participate in developing said Plan. Have these steps been taken? It sounds like Town Council is pretty excited about the M.A.D.E. Plan, but is that because something/anything was offered, or because what was offered fit into a Plan…if the latter, when were citizens invited to help prepare that Plan? Can we see it, before we see the Proposal? The prospect of 300 new citizens in the Town is scary/attractive…but where will they come from and what will they come for? More jobs at Town Hall? The project seems waaaay over the top. Would the developer be required to build the proposed accommodations no matter what, or would they be allowed to add commercial components in future years to help pay for the thing when their blue-sky plans don’t work out? And don’t the neighbours have a prior right to protect their neighbourhoods? And don’t we want to keep and promote recreational areas? I hate to see a new venture given the usual Mahone Bay protest response…but that may be more the fault of the proposers than the protesters. Go slow. Consult. Listen to the people. When I first moved to the South Shore 10 years ago, and lived in the town of Mahone Bay I regularly walked in the wooded area behind the soccer field. I have always been a ‘woods’ person and find particular resonance in an undeveloped wooded area. There is so much for all of our senses to discover where tall pines, old apple trees and creek beds intermingle. The town of Mahone Bay is auspiciously situated between a protected body of water and gently rising hills. The field and wooded area provide a balance to the sea in all its moods. As human beings we need both; openness as well as enclosures to retreat to. Why must it always be a struggle to secure the things that nuture the human spirit; art and music in the schools, a community center, shopping downtown amongst small business owners and now a field embraced by a cathedral of trees. Let’s think a little more creatively about Mahone Bay as a destination for people in our own province and give them even more reasons to come here, like an outdoor theatre on the field and in the woods. I have been a resident and business owner in Mahone for over 30 years, and I think that this proposed developement is totally off base. To drop into an established historic town three story apartment buildings and densely built housing is unbelievable!! Our town’s infrastructure is stretched to the maximum right now with a population of 900+. How will we manage 300 more? Lack of parking, water and sewer problems need to be addressed. The location of this proposed project is shocking. To sell the town’s soccer field (one of the best in the province) and mature forest and wetlands without consultation with citizens of the town is just not acceptable. This area is one of the many reasons this town is so unique! In a time when enviornmental issues are making head lines everywhere, and with strong environmental legislation being presented by our Provincial Government at this time, how can we stand by and let Mahone Bay become a laughing stock? Do we really love the beauty around us? Don’t destroy the field where the children get so much enjoyment from their sports groups. 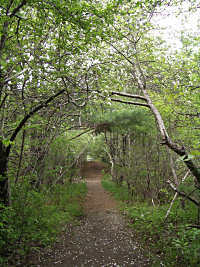 When I chose to move to Mahone Bay with my children, my choice was certainly influenced by the assets of a small town that seemed to treasure many of the values that I hold dear… a beautiful green common space, recreational outdoor facilties, woods and trails that are integrated into the town’s boundaries and offer the residents a safe, beautiful and readily accessible connection with nature. Two short years after making this choice based on what I believed was the enlightened decision to uphold the basic “sacred trust” of offering and protecting these assets, I find that the Town Council has decided unanimously that these are all assets that are unnecessary and can simply be wiped off the map with a handshake deal with a developer. In pursuit of 300 prospective residents who may or may not exist and may or may not ever find their way to this proposed development, we have a Town Council decision that completely negates any consideration of the desires or needs of the people who have already chosen to live here. Surely there is something deeply flawed in this logic. I think we can all appreciate the Town’s desire to address a shrinking population/tax base, but it would seem to go without saying that those who already pay taxes here and those who live in the greater communty and benefit from the existence of this soccer field and enjoy the beauty and quietude of the woods, should be included in any decisions regarding their future. This project, as it stands now, lacks foresight, wisdom & respect. We are a creative, intelligent community who will come up with exciting, progressive, intelligent plans for creating & maintaining this magical place we live in. This is our chance to stand out and be amongst the most progressive & coveted communities in Canada. What we have here in Mahone Bay is priceless & desirable to millions of people. The real issue here is economic. If there were jobs & business oportunites here THEN we’d see the natural renewal of the Town take place. No need for this destructive plan when so many constructive things are possible.